ife for location sound mixer can be tough. Today's sound-conscious audiences recognize the difference between good and indifferent audio; securing a well-recorded production track while on location can stretch the technical skills of even the most seasoned veteran. During a recent location shoot for Steven Soderbergh's upcoming movie, Erin Brockovich, production mixer Tommy Causey made use of a new console that bristles with application-specific features. With 20 years experience working on a number of successful films - including Bullworth, Lethal Weapon III, Broadcast News, The Other Sister, and The General's Daughter - Causey was looking forward to using Cooper Sound System's new CDS208 Location Mixer, a full-featured portable that updates the existing CS106/108 product line. "The CS208 is an eight-channel mixer that that offers comprehensive communication features," Causey states. "But for me, the key to success is the fact that the CS208 offers four main and two auxiliary outputs. Most location mixers only offer stereo/two-channel output and a single aux send. Increasingly, I need to print a couple of extra tracks in addition to the primary two-channel pair, as well as handle feeds to a number of other destinations. The CS208 addresses these needs in a compact, great sounding package." The CS208 also features remote rolls for Nagra, HHB, Fostex, and other compatible recorders. "For backup, we sent the same mix to a Stella DAT digital recorder," he continues. "But we often need to print a third or fourth track - maybe a PA playback during a crowd scene or a telephone side of a o-way conversation with a third actor, which is where the CS208 is outstanding. Additional tracks are normally recorded onto a second Nagra or digital deck." The CS208 features two stereo tape returns for confidence monitoring. 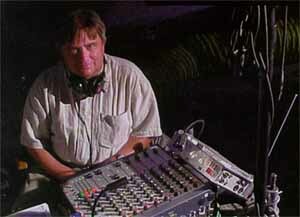 Causey says that on more and more shoots, the location mixer has to provide separate sound feeds to production staff. "While the director and script supervisor can be listening to one auxiliary output, I can prepare a completely separate mix for the video assist or a documentary crew accompanying the shoot. That flexibility is very useful. The CS208 also has comprehensive communications functions, enabling me to supply, if necessary, headphone monitor outputs to two boom operators." "Cooper Sound Systems has improved several user features," Causey considers. "On previous models, input connectors were located on the rear and side panels, making it difficult on a crowded sound cart to provide easy access. Now all connectors are located on the rear panel where we can reach cables more easily between setups. Front-panel controls are laid out ergonomically for maximum convenience with plenty of clearance between knobs and switches." "It just sounded right," Causey says of the CS208's performance during his supervising sound editor Larry Blake's location recording of Erin Brockovich. "We were using [Dolby] SR [noise reduction] on the Nagra running at 15ips. The CS208 behaved flawlessly; we did not hear the peak limiters [used to eliminate tape-overload distortion]. We picked up what proved to be the first production version of the CS208 on May 25 and never had one problem while on location. It performed flawlessly."